Already on this blog, we've seen the solo debuts of locally based former backing singers Kate Ceberano, Jenny Morris and Wendy Matthews. Before any of those women hit the ARIA top 50 with their own releases, one of the most recognisable female voices in '80s pop stepped out from behind the band she performed with. She had the full support of the band she'd backed - they even helped write and perform her first single. Question was: would her solo record be as big as the chart-toppers she'd already performed on? Another British band whose backing singers would eventually strike out on their own scored their very first Australian chart-topper this week in 1984. Wham! brought an end to The Twelfth Man's run at the top by climbing to number 1 with "Wake Me Up Before You Go-Go" for the first of seven (non-consecutive) weeks. It had been the second - and most successful - single from Silver in the UK in late 1983, but this drippy ballad ended up as the third - and least successful - one locally. As "State Of Shock" inched up just one place from last week's high-flying debut, this lead single from Jermaine Jackson's self-titled album was a more under-the-radar release. After a couple of smash hits, Pseudo Echo's dream run hit a speed bump with this third single flopping. Parent album Autumnal Park had debuted (and peaked) at number 11 in mid-June, however. 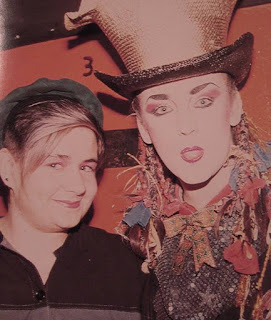 She wasn't an official member of Culture Club, but can you imagine songs like "Church Of The Poison Mind" or "Victims" without the input of backing singer Helen Terry? By 1984, Culture Club's label, Virgin Records, obviously thought her profile was high enough to give her a shot in the spotlight and released her debut solo single, "Love Lies Lost". Keeping things in the musical family, Helen co-wrote the track with Boy George and Culture Club's guitarist/keyboard player, Roy Hay, who both performed on the song, as did drummer Jon Moss. Although the bouncy, soulful pop tune perfectly showcased her powerhouse vocals, it ended up not being as big a hit as anything Culture Club had so far charted with. The story was the same in the UK, where it also peaked at number 34. 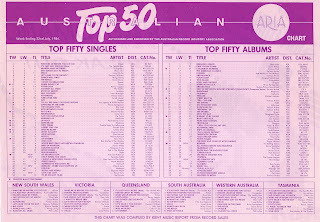 Despite continuing to release music until the end of the decade, Helen only made this one appearance on the ARIA chart. These days, she works in TV, most recently as executive producer of the BRIT Awards broadcast. Joining "Street Dance", "Up Rock" and "Breakdance" on the top 50 was yet another breakdance-related track - in fact it was the theme tune to the movie also called Breakin', which is really only notable now for being the first film Ice-T ever acted in and also featuring an early uncredited appearance by Jean-Claude Van Damme. The duo of drummer Ollie E Brown and singer/bass player Jerry Knight had previously worked together on the debut album by Raydio - the group fronted by Ray Parker Jr. A top 10 hit in both the US and the UK, "Breakin'... There's No Stopping Us" performed surprisingly averagely in Australia. The pair released a follow-up, "Electric Boogaloo", which was, as you probably guessed, taken from the film's sequel Breakin' 2: Electric Boogaloo, but that single didn't chart at all locally. Following up the international juggernaut that was the True album was always going to be difficult, but Spandau Ballet didn't do too badly with this lead single from Parade, which just fell short of the top 10. Not as classic a song as "True" or "Gold" (which had immediately preceded it), "Only When You Leave" was nevertheless another sophisticated blend of pop and soul that was just made for radio. 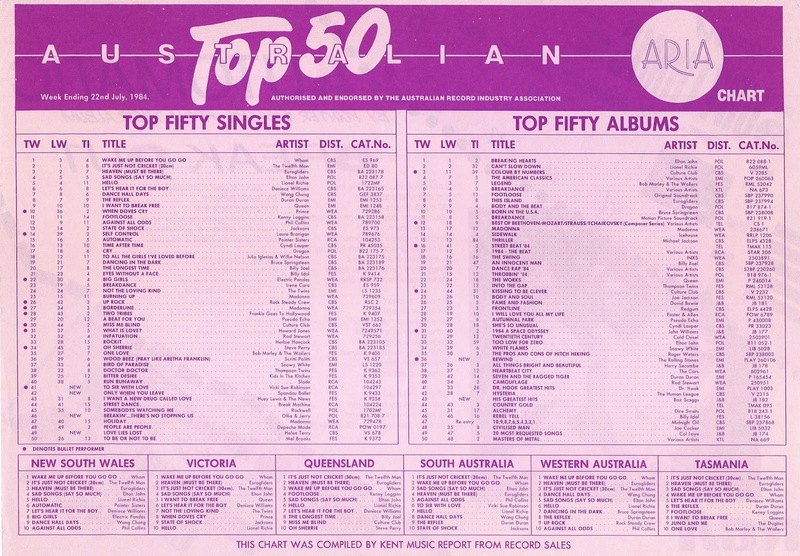 Of course, whether or not Australian radio played Spandau Ballet at the time is another issue entirely. Here's another female performer whose earliest appearances on record were as a backing singer. Better known as a theatre actress, Vicki Sue Robinson had found solo success with her 1976 US top 10 single, "Turn The Beat Around" (a number 28 hit in Australia). Then followed years of flop singles until this dance cover of the soundtrack tune by Lulu (an Australian number 14 and US chart-topper in 1967) unexpectedly reached the ARIA top 10. The upbeat arrangement works reasonably well compared to the slower Lulu original - although "To Sir With Love" is such a great tune that it'd be pretty hard to completely destroy it. Next week: a superstar duet from a pair of singers who know a thing or two about superstar duets. Plus, a song named after an actor that's not about what you might think. Don't think I knew the Pseudo Echo song at the time; maybe it didn't get enough exposure to be a hit? I primarily know the Ollie & Jerry song via the Ilanda/Joanne cover from 2000. I remember hearing 'True' and 'Gold' a lot on the radio in '83, but don't think I knew 'Only When You Leave' at the time, so maybe radio didn't play it (at least in my state). Either that, or it just didn't stand out. I don't remember the Vicki Sue Robinson song at all.